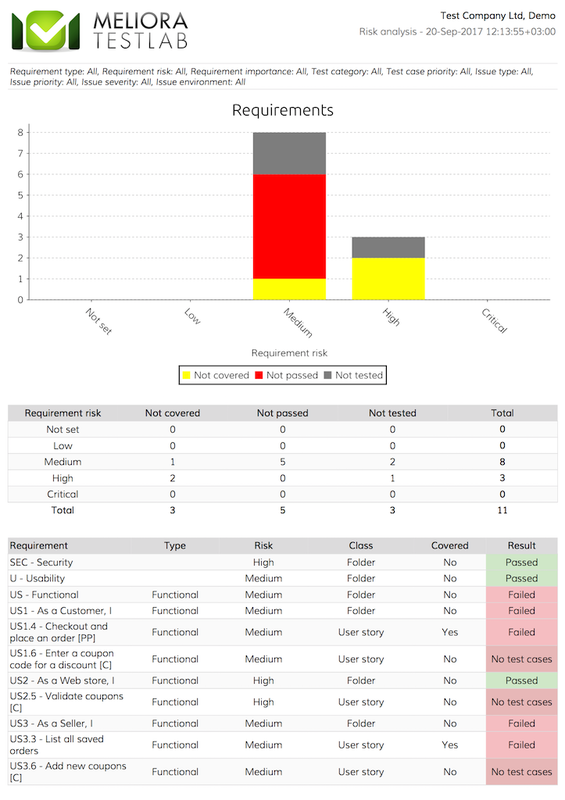 We are proud to bring you a new version of Testlab – Parallax Denigrate – with usability-related features and risk analysis reporting. 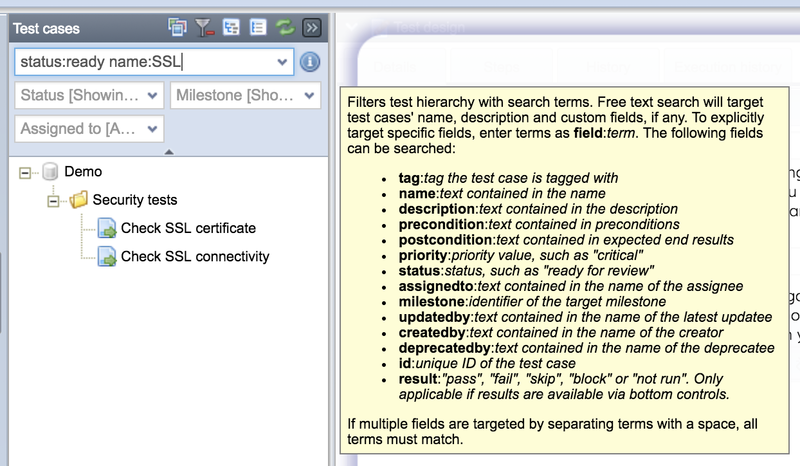 Assets organized in tree structures, such as specification related assets (requirements, test cases, and test sets, can be filtered by a search field at the top of the tree control. This makes it easy to filter into the tree the assets which you are interested in. “name:plane tag:customer” shows all test cases with a word “plane” in the name of the test case and with a tag “customer”. As said, this logic works with all trees in Testlab – including the pickers which are used to select assets related when editing. The UI has also been added with an easy help on the syntax as a tooltip. Often, the people responsible for the project are asked tough questions on the status of the project or product: How well is it tested? Can we go to production? Do you think the product is in a good enough for release? The manager must basically make an educated guess with the best possible information available – often from the data in the test management tool. issues not yet resolved or closed – grouped by severity or priority. As a combined single report, this report provides essential information for the manager to make his decision. Features have been added to support issue-centric testing better. 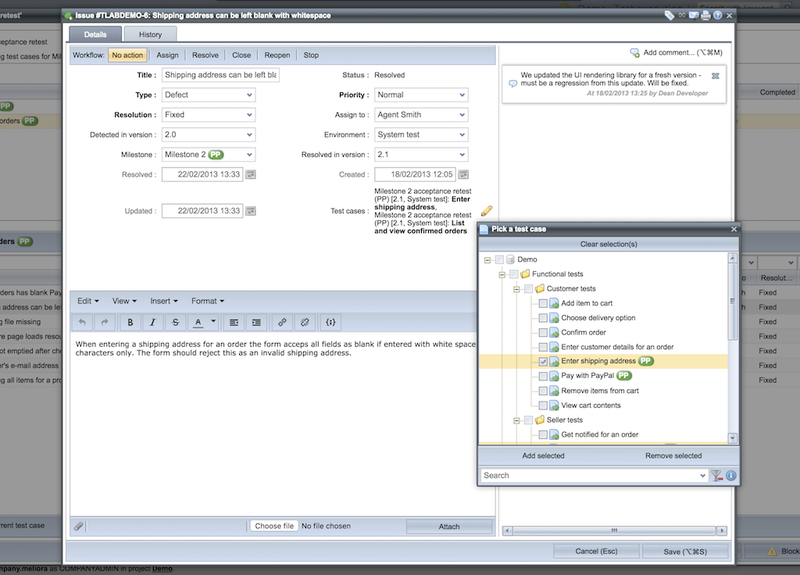 Previously, issues in Testlab could be linked to a test case and a test run but in this new version of Testlab, it is possible to link multiple test cases (optionally via a test run as executed tests) to a single issue. The controls while editing the issue have been changed appropriately to make it easier to link an existing issue to a test case. While running tests, you can now easily add the test cases linked to an issue as executable tests to your current run. To do this, click the “Add linked test cases to this run” control via the Issues tab while running tests. While running a test, you can also add a link to an existing issue by clicking the “Link to current test case” control via the Issues tab. Note: Due to this change the REST-API model has been updated. The old format is still supported for a single link but is due to be deprecated in future releases. Please see the documentation of DefectResource-endpoint in your Swagger instance (https://yourtestlab.melioratestlab.com/api). The controls at the bottom of the test case tree are used to highlight the test cases with testing results. In previous versions of Testlab, the controls limited you to fetching the not passing results only. The controls were designed from the re-testing and regression testing point of view. In Parallax Denigrate, these controls were changed in a way so that you have an option to simply filter in results for test cases from your preferred viewpoint (latest results in the project, results for a milestone, for a version or for a single test run). The actual change in the UI is that you also get the results for passed test cases. This makes these controls more flexible and the use of these controls is easier in different usage scenarios. The pickers now feature the same searching feature introduced earlier (see “Targeted filtering of tree assets” above). This makes finding the asset from the tree much easier. When picking assets, you have an option to add or remove the selected assets from the set of current values. The “Do not include sums of zero” option on the requirement, test case, issue and project grouping reports now filter out sums of zeroes from both axes (“Field to report” and “Group by”). Previously, the option filtered out sums of zeroes only from “Field to report” axis. When old revisions (or otherwise deprecated assets) are included in reports, the assets are now highlighted with a gray color and also, the date when the asset was revised/deprecated is shown. When reporting the latest results only on “Results of run tests” report, the report now also includes the test cases not yet run. “Execution status of test cases” report has been added with two new options to customize the report’s behavior (“Test cases in test runs only” and “Result for latest revision”). Please see the inline tooltip helps for these two options on this report on the logic of these options. When editing a single issue, you can save the edits without closing the window by keeping Shift-key pressed. When batch editing assets in the table view, top-right corner change event notifications are no longer generated to your teammates. For deprecated test cases in the list of test cases in test execution view now includes the timestamp of the deprecation (when the test case was revised or when the test case was deprecated). The state of “Show events” checkbox at the top right corner is now saved and remembered between sessions. Copying and pasting with keyboard shortcuts now work as expected to step editor’s pre- and post-conditions. Usenet is a distributed discussion system which enables you to read and post messages, often termed as “news”, still existing but more popular back in the days. Usenet features newsgroups on various different topics and was a popular place for discussion. 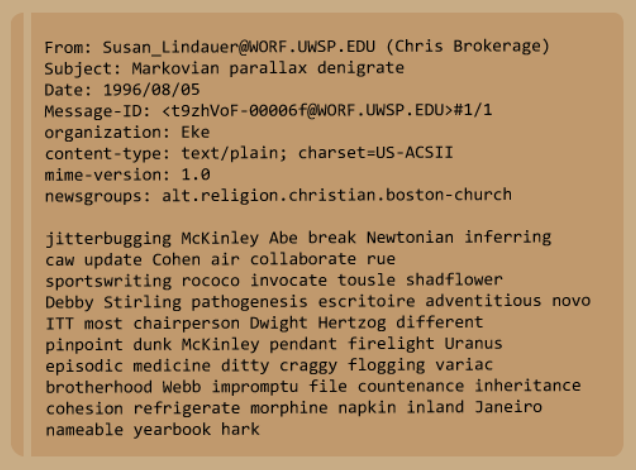 In 1996, a series (hundreds) of unexplained word puzzles were posted to different newsgroups. The title for all these posts was “Markovian Parallax Denigrate” and each post contained a series of words which cryptographers and hackers have been trying to decipher – with little success. Some theories exist but the “Markovian Parallax Denigrate” has still been referred as “The Internet’s oldest and weirdest mystery”.